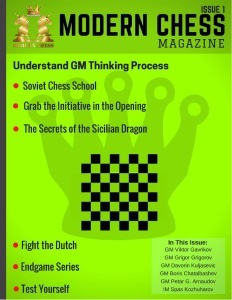 “Modern chess” is a magazine of educational type, publishing Grandmaster’s lectures concerning all the stages of the chess game – opening, middlegame and endgame. The articles are interrelated, each one of them being a part of a comprehensive course on a specific topic. Besides the opportunity to read the magazine in PDF, you are offered an interactive version, accessible from the web site. Therefore, “Modern chess” is a digital educational platform, suitable for anyone who has the ambition to improve his knowledge on the chess game. Among the authors you can see the names of eminent Grandmasters as Viktor Gavrikov, Boris Chatalbashev, Davorin Kuljasevic, Nikolay Ninov, Grigor Grigorov and Petar Arnaudov. Each visitor of the site may purchase a single issue of the magazine or to make annual subscription (subscribers have the option to download the PDF file of the magazine). The link is broken. Would it be possible to re-upload. Can you upload the link again please. Thank you.